On this Thanksgiving morning, I want to start by giving thanks. As the song above says, I first want to thank God for getting me through to another Thanksgiving. We are not guaranteed tomorrow. So, each day is a new gift and even though I so often lose sight of this fact, God is faithful. Everything I have in life is a gift from above. As it relates to this blog, I’m very thankful to have the opportunity to write about this journey of mine towards becoming a runner and beyond. Thank you to all of those who read this blog for taking the time to read about it all. Thank you to all of those who have left comments over this past year. I really appreciate the encouragement provided in them. In addition to that, I’m thankful to have found so many other wonderful people who have their own blogs where they share their own journey. If I remember correctly, since the end of April, I have only had like one or two weeks where my workout total was less than 3 in a week. The combination of writing a blog of my own and reading about the journey of others has provided me with enough motivation to continue pressing on. For today’s blog, I’d like to highlight a few of the postings that have been memorable for me. If you haven’t already taken the time to read from these bloggers, I highly recommend each and every one of them. First up is Kim of Maker Mother Marathon Runner. Over this summer, Kim was diagnosed with cancer. 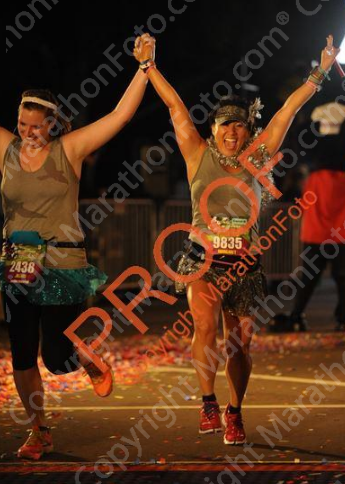 She had surgery in July and was still able to finish the Dumbo Double Dare Challenge at the Disneyland Half Marathon Weekend (adding the 5K race to the mix)! Even before the cancer diagnosis, Kim was awesome to follow. If you haven’t visited her Youtube channel, you should. She makes wonderful running related videos. However, her determination to continue on her quest to run 50 marathons in 50 states in spite of cancer treatment is nothing short of amazing. 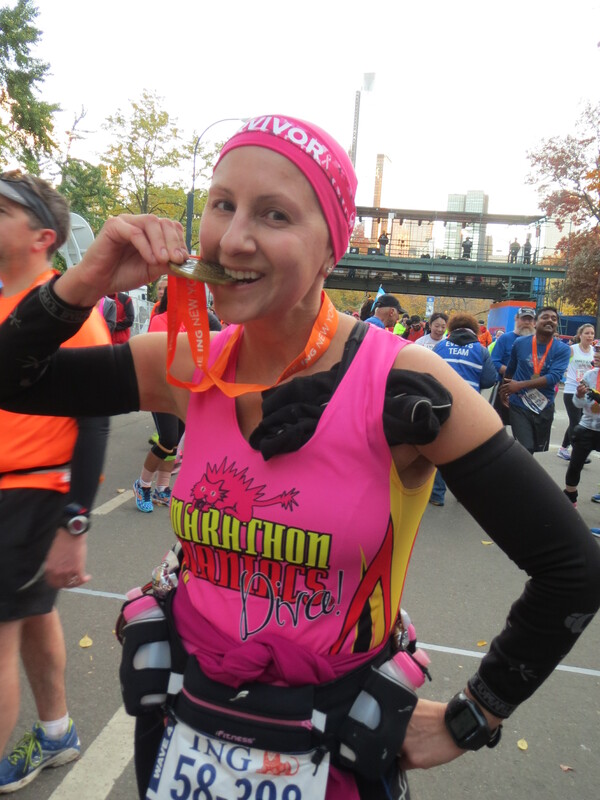 This post was her recap from the ING New York City Marathon. She finished this race just days after a round of chemo. Amazing! It was a real honor to meet this amazing person right before the Disneyland Half Marathon. If anyone can beat cancer, I believe Kim can. Next up is the always inspiring Linzie of See Sharp Run. Earlier this year, Linzie had another blog with the same name. On it, I read his story about his first marathon at the 2013 Walt Disney World Marathon. He not only did the marathon, but completed the Goofy Challenge. His story from that day was one that got me thinking about running in the 2014 Walt Disney World Marathon. Here I am, less than two months away from doing that. Linzie’s blog post was part of the reason why I signed up. On top of that, he has written many inspirational blog postings. He doesn’t post every day. However, he more than makes up for the lack of quantity with quality. I really was inspired by reading his blog post entitled, “Celebrate the Small Stuff.” This blog post is a great example of what you will find on his blog. I also loved his recap of running in the 2013 Bank of America Chicago Marathon. 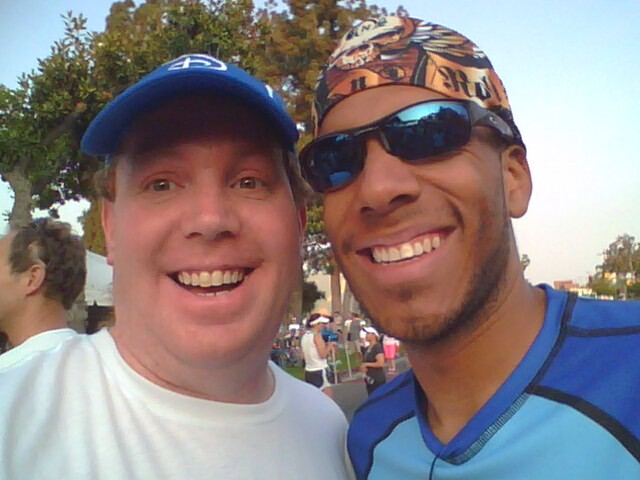 I met Linzie for the first time at the Pasadena 10K. He was running the half marathon and I was running the 10K. He’s a super cool dude who just decided to go out and run a half marathon that weekend. When I grow up, I want to be able to do things like that. One running blogger I’ve recently come across is straight up crazy. Brian from the Pavement Runner is someone I’m seriously in awe of every time I read his blog. This guy really pushes the boundaries for me of what is possible. He was an ambassador for the Rock n Roll race series this year and I honestly don’t they could have picked a better person to represent them. This guy’s love of running shows me new limits of dreaming. A few weeks ago, he ran in the Rock n Roll San Antonio Half Marathon and the Rock n Roll Las Vegas full Marathon on the same day! Yes, that’s right. He ran the Goofy Challenge on ONE single day! 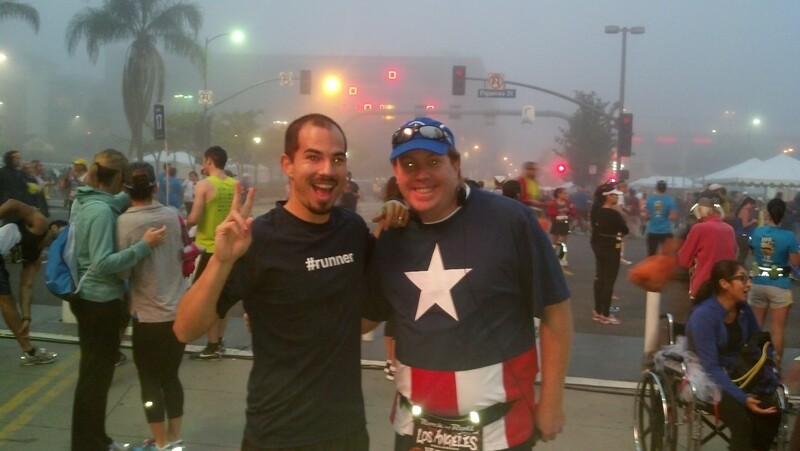 I met Brian at the Rock n Roll Los Angeles Half Marathon. He’s just as nice in person as he appears on his blog. Yes, as I came to the finishing stretch of the Disneyland Half Marathon this year, I was looking for Mickey because I wanted a picture something like Pam’s. 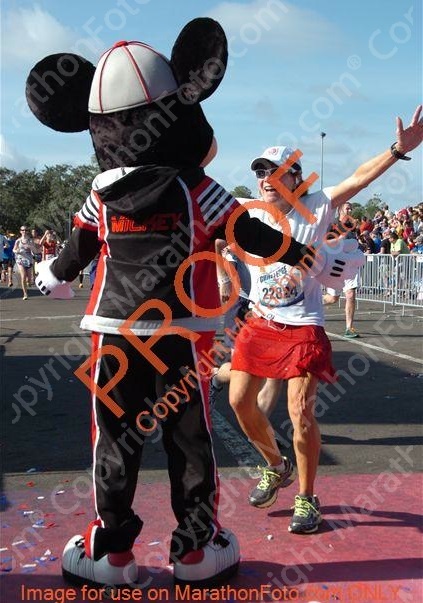 I may not have hugged Mickey like Pam did, but a high-five will also work. Christine from We Run Disney ran her first marathon this fall…the Marine Corp Marathon. As I’ve followed along, coming a few months behind her, I’ve been able to see some of what awaits me in my training. Of course, through that, I’ve learned that comparing yourself to another runner can be a bad thing. When Christine had a great 17 mile training run, I expected to have the same. When mine didn’t match, I was a bit disappointed. However, it taught me that we are all different. The only person I need to compare myself to is me. I’m not an elite runner. So, I’m really competing with myself. 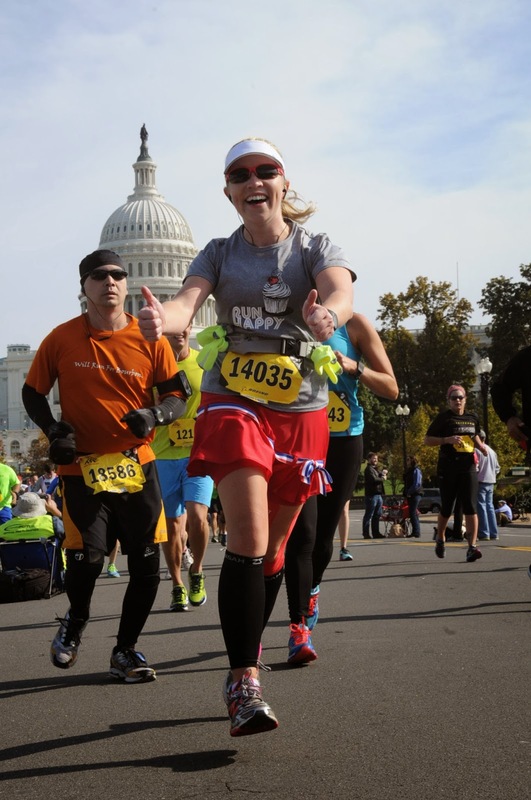 It was a little emotional for me to read of Christine’s Marine Corp Marathon experience here. This week, she posted some later reflections that were simply inspiring. Check that out here. Another runner who I’ve come to admire is Krissy of Outrunning the Monorail. 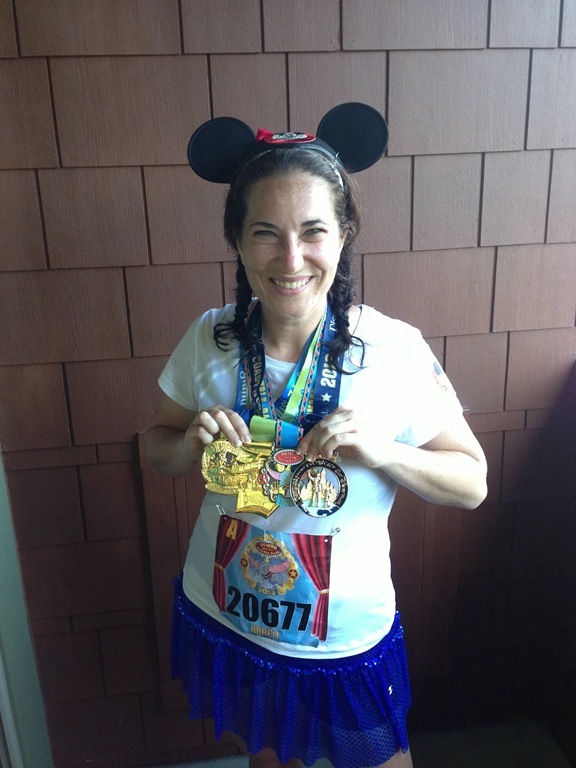 She’s a great person to be following if you’re a runDisney fan. She’s a real pro with these events and has some great advice. In a more recent posting, she talked of running in the Wine and Dine Half Marathon in a later corral than she was used to. Her perspective matches my experience of running in corral G of the Disneyland Half Marathon. I can appreciate that she willingly placed herself back in this latter corral just to run with a friend and encourage that friend. So many people would be all about running a great race and wanting to finish as quickly as possible. To watch someone who is pretty fast, hold back to help a friend is really cool. Check out that blog post here. Karen from Just Me and My Running Shoes is the person who has left me the most comments on my blog. So, I need to give a shout out to her blog as well. Karen is a big huge Disney fan and active runner. 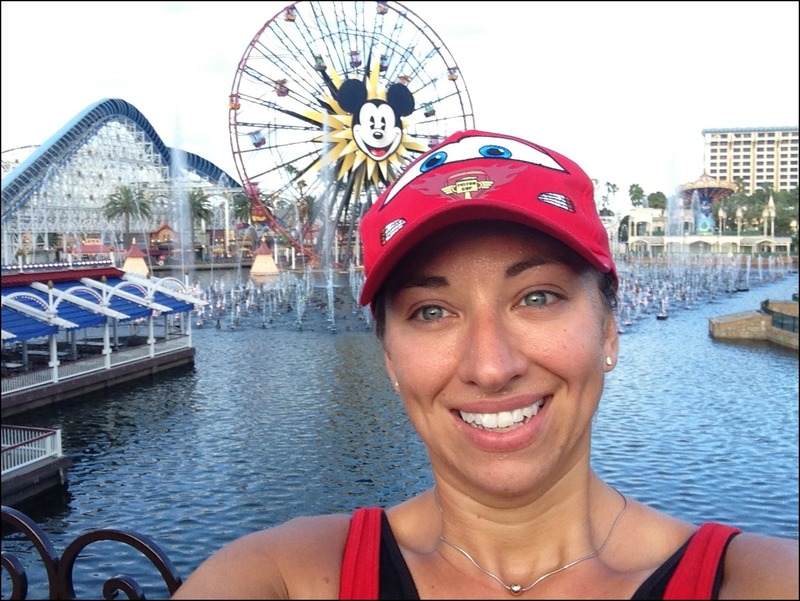 Her blog offers more than just information relevant to running and Disney. She uses her blog to just share life. I love how relatable she is on her blog, which is why I come back. Two of her blogs from when she came out for the Dumbo Double Dare were really cool. Recently, she shared about taking the Walk in Walt’s Disneyland Footsteps tour here. Reading about that tour totally makes me want to take it one day. I also loved her coverage of the Disneyland Half Marathon. Check out her recap here. Karen also has some really fun Vlogs that are on her Youtube channel. Danielle from Live, Run, Grow is a run blogger who is someone I really respect. She’s offered some great advice that has been helpful to me as I’ve been training. If you want to know how to do an ice bath, check out her blog about that. Here is another very useful blog called RICE for Runners. However, Danielle is not just great with training advice. She posted my absolute favorite recap of the Inaugural Disneyland 10K race. I could go on because there are so many blogs I could highlight. These were some of the ones that came to mind as I thought of my running journey this year that have encouraged and inspired me in some way this year. I wish I could highlight more. However, this blog has already run way overboard. I hope that, if you haven’t checked out the blogs I’ve highlighted here, you will check them out. Don’t just check out the individual blog posts I’ve linked here. Visit their blogs and follow them. You won’t regret it. This post made me cry. Thank you for your kind words, I am so thankful for the wonderful world of friends and community I’ve met, been inspired by, and very humbly, have inspired through the love of running. Thank you, Greg – thankful for you!!! It’s such an honor for me to join the wonderful community of runners. It was a pleasure to highlight your blog. Thank you for sharing your experiences and advice. Us newbies have learned so much through runners like yourself. Keep on sharing! Wow!! I’m thankful to have met YOU at the Disneyland Half because your posts have continued to inspire me. I too follow the runners in your post and encourage all to do the same. I look forward to following your journey to the 2014 WDW Marathon! Keep us posted!!!! I will. You know what I thought when I saw you were having a chemo treatment a few days before the NYC Marathon? Even Lance Armstrong couldn’t do that. Can’t wait until the day I get to hear that you’re cancer free! Thank you so much for including me as a part of this wonderful list of bloggers, each one of them truly is inspirational in their own way and I’m thankful to have met and become friends with a few of them. I actually got to know Kim this morning at the Manchester Road Race (again just a few days after a chemo treatment!) and she just has the most wonderful personality, I’m so glad to have finally gotten to know her! P.S. – the Disneyland 10k recap was probably my favorite post I’ve written, I’m so glad to hear that you enjoyed it! Thank you Danielle for writing such a great blog! Yes, Kim is a wonderful person. It was great for me to meet her at the Disneyland Half Marathon. There are so many great running bloggers out there. I could have included more people. However, the blog post got a bit too long. 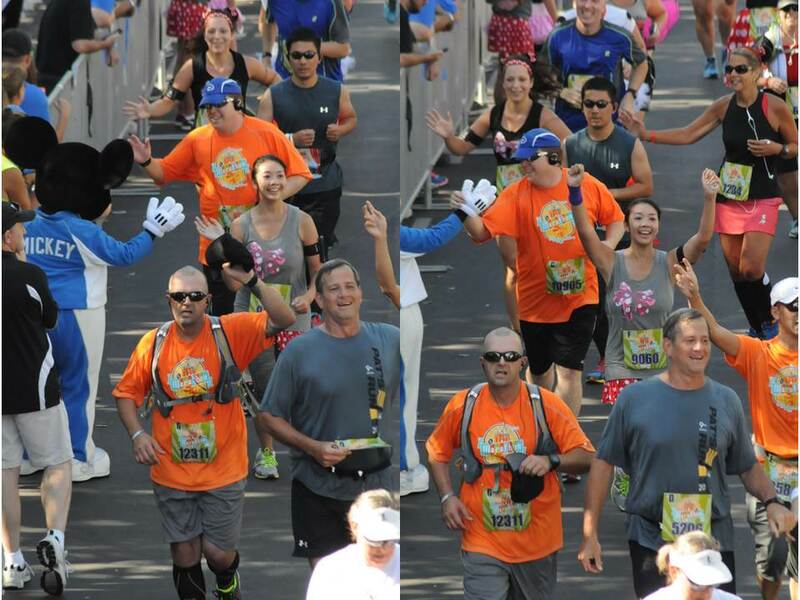 Your Disneyland 10K recap was just pure awesome! It looks like you had a pretty great race crew to run with!